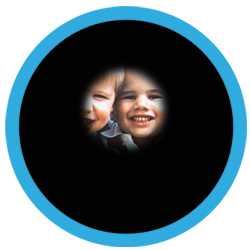 Retinitis Pigmentosa (RP) is actually a name given to a group of inherited diseases of the retina. It is most commonly diagnosed during childhood or young adulthood. RP causes the degeneration of photoreceptor cells in the retina. These cells are responsible for detecting and processing light that enables us to see. As these cells degenerate and die, patients experience progressive, severe vision loss leading to legal and/or complete blindness. The first and most common symptom of RP is difficulty seeing in the dark, or “night blindness.” As the disease progresses, patients lose their peripheral vision. This vision loss can occur in peculiar patterns, leaving “rings” of vision, or “islands” of vision in the far periphery. Some people with RP retain a small degree of central vision, much like looking through a straw, throughout their life. Other forms of RP affect the central vision first. This is often followed by loss of color differentiation. These symptoms are then followed by night blindness and loss of peripheral vision. RP and its related conditions are rare and difficult to diagnose. If you suspect that you or your child may have an eye condition, please contact a vision care professional for a complete eye exam as soon as possible. If you don’t have an eye doctor or cannot afford an eye exam, please contact our agency and we will help you. RP is not curable. Intensive research is under way to discover the cause, prevention, and treatment of these conditions. For more information, please refer to the Foundation Fighting Blindness (www.blindness.org). To learn more visit the National Eye Institute.